All circuits need further development. 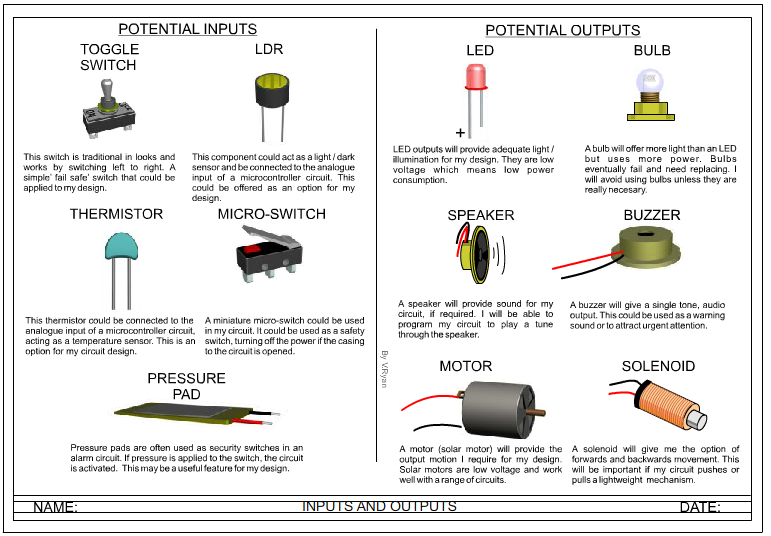 In the ideas section of a design folder, circuits are identified as possible solutions for the product being designed. In the development section, a circuit is usually selected for further development. PIC Microcontroller circuits are often selected as they can be programmed to react to inputs such as pressure pads, switches or other sensors. Before attempting this sheet you should have looked at traditional circuits such as 555 timers or 741 operational amplifiers and how they could be used for your project. 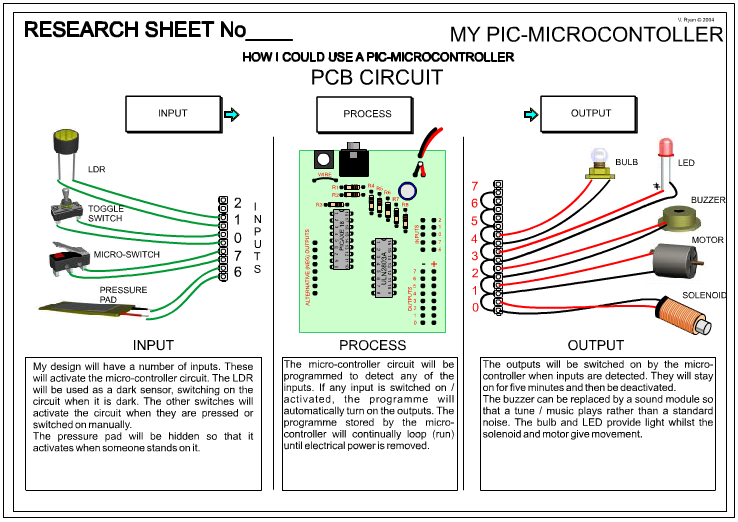 The example shown below is a design sheet for a microcontroller circuit used to control a model. The example shown below is a basic example of a microcontroller design sheet. 1. The page has been divided into INPUT - PROCESS and OUTPUT. Many circuits can be divided in this way. This is a systems diagram. 2. All the possible inputs you could use to activate your circuit should be drawn and labelled on the INPUT side of the design sheet. Remember to describe how each input could be used as part of your project. 3. The central part of the sheet is the PROCESS. The microcontroller circuit and the programme it contains detects when the inputs have been activated and then controls how the outputs work. 4. The OUTPUT side of the design sheet should contain drawings of all the possible outputs that you could use in your project. The example shows LEDs, a motor and solenoid. Other outputs could be sound or music modules. Can you think of any more? 5. When drawing outputs or inputs, draw each carefully and accurately. If you have difficulty drawing consider drawing electronic symbols as these are normally fairly simple. 6. You may prefer to use clipart or photographs of inputs and outputs if you find drawing very difficult. 7. Explain how you want your microcontroller circuit to work. Keep its operation simple. Complex programmes often fail when transferred to the microcontroller IC. 8. You may wish to add a little information regarding how you want you programme to work. This could be written in the process part of the design sheet. Look closely at different aspects of circuit development. For instance, producing a sheet showing the type of input and output devices you may use, may be important as part of the development section of your project. A. Before drawing any inputs or outputs, write down how you want the microcontroller circuit to control your project. Keep this clear in your mind. B. Start by drawing the inputs and explain how they may work as part of the project. Then move on to the process and output sections. C. Look at past projects and how microcontroller circuits have been used. D. Complete your homework on time. Do not fall behind as you may find it impossible to catch up.